Choose a page number to see the recommended websites for this book. Watch amazing videos of the microscopic world. Compare the relative sizes of cells and organisms sitting on the head of a pin. A scientist talks about the beauty of the microscopic world. Play a Christmas game and guess what's under the microscope. More incredible images of objects under the microscope and the stories behind them. A fabulous and revealing introduction to the secrets of the microscopic world. Features amazing photos of what can be discovered through a microscope, from atoms to algae and dust to DNA. With over 20 step-by-step microscope activities including preparing slides and observing everyday objects, insects and even your own cheek cells. 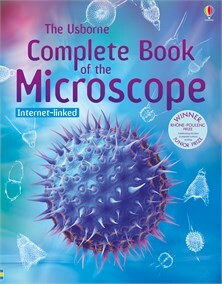 Includes practical information on buying, using and taking care of a microscope. With internet-links to websites with more amazing photos, projects and activities. Kirsteen has been at Usborne since 1997, coming from a background in music, education, and religious publishing. In that time, she has written and edited over 300 titles, ranging from board books and flashcards to dictionaries and encyclopedias, on themes as diverse as chess, vampires, gerbils and microscopes. Most recently she has been busy writing practice, puzzle, sticker and activity books to engage, entertain and educate children at all ages and stages. This fascinating book features stunning photography showing a huge range of subjects - bed bugs, hair, watery minibeasts and more...shows so well just how much there is to explore through the microscope. I really enjoyed the interactive nature of this book. The basics of using a simple light microscope are described, and a variety of tutorials are given through the book. These include methods for preparing microscope slides and staining them to highlight particular structures. But it’s not just limited to microscopes – readers are instructed on how to make simple agar plates to grow bacteria from their fingers or food, and on how to find miniature fossils and make your own crystals. This is a very stimulating book, which at the same time puts the microscope in an historical context.